uuid : 359a45e1-b498-4204-bb43-0ae313ee6ff0 templates_id: 119561 templates_uuid: "2298c047-e6a5-463f-b89b-d29683b54b9c" title: "Poor Performance Appeal Hearing Letter - Notice of Poor Performance Appeal" display_name: "Invitation letter to a poor performance appeal hearing" meta_keywords: "Poor performance appeal notficiation" description: "
Make sure you do things right when you invite an employee to a poor performance appeal hearing, with this invitation to a poor performance appeal hearing. The notice of poor performance appeal hearing sets out in clear and simple terms the process to be followed and the employee\'s rights, helping ensure that the employer complies with the laws on performance evaluation. What is an invitation letter to a disciplinary appeal hearing for poor performance? An invite to an appeal hearing should be sent out in advance of any appeal which follows the initial disciplinary hearing. The appeal may proceed either as a full rehearing, effectively re-running the first stage of the process or as a review, where the procedural fairness and severity of the original decision will be scrutinised by a new person. An effective right to appeal can remedy procedural defects in the original decision, if correctly handled. for further information read How to run a disciplinary hearing. The ACAS Code of Practice on Disciplinary and Grievance Procedures says that the employee must have a reasonable opportunity to call witnesses to the hearing and the opportunity to make points to the meeting about witness evidence. Can increased sanctions be imposed as a result of an appeal? No. The ACAS Code of Practice on Disciplinary and Grievance Procedures says that appeals cannot result in an increased sanction as it may deter individuals from appealing. If the appeal does result in an increased sanction, it is advisable to offer a second appeal against the new sanction. When should an appeal decision be provided? 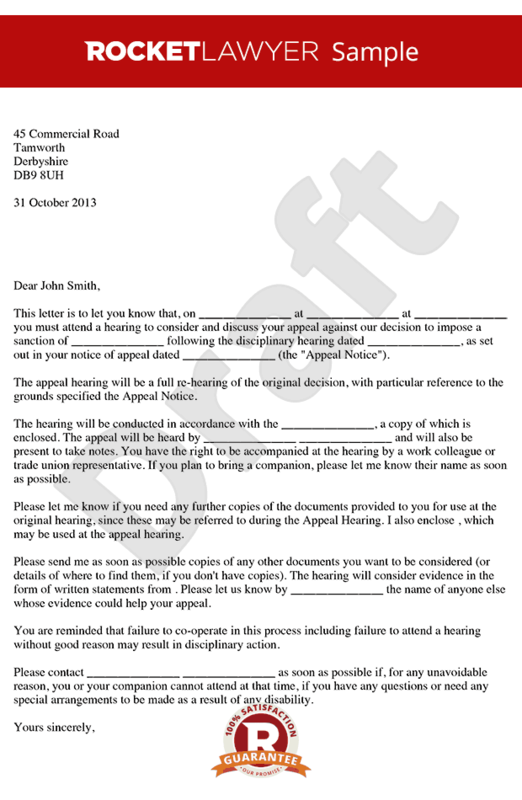 Employers should inform the employee of the appeal outcome in writing as soon as possible after the hearing.
" created_timestamp: "2018-10-08 04:36:57.0" modified_timestamp: "2018-10-08 04:36:57.0" active: true created_by: 236 modified_by: 236 dcm_id: 256 url_slug: "Letter-inviting-an-employee-to-an-appeal-hearing-relating-to-poor-performance" meta_description: "Create an invitation letter to a poor performance appeal hearing with simple guidance from Rocket Lawyer. Make sure you do things right when you invite an employee to a poor performance appeal hearing. Try this notice of poor performance appeal hearing. " time_to_complete: "10 minutes" role1: "Employer" role2: "Employee"
Make sure you do things right when you invite an employee to a poor performance appeal hearing, with this invitation to a poor performance appeal hearing. The notice of poor performance appeal hearing sets out in clear and simple terms the process to be followed and the employee's rights, helping ensure that the employer complies with the laws on performance evaluation. More than just a Invitation letter to a poor performance appeal hearing template, our step-by-step interview and guidance makes it easy to create your document. Easily create online, download, print and sign your free Invitation letter to a poor performance appeal hearing in minutes. This document is also sometimes called: Poor performance appeal notficiation.